I spent six months in Switzerland my final year of high school, and since then muesli has had a permanent presence in my breakfast routine (a Swiss physician invented the classic meal). The healthy breakfast recipe, comprised of oats, nuts, seeds and/or dried fruit soaked in liquid (milk, yogurt or water), is filling, highly nutritious and most importantly, quick to make. If you’re wondering, the difference between muesli and granola comes down to the fact that muesli is not cooked. I soak my oats (avoid any instant oats) overnight to save time in the morning and make them (or any grain for that matter) more digestible. Soaking them also allows for better absorption of calcium, magnesium, copper, iron and zinc by neutralizing phytic acid, the “anti-nutrient”, that’s contained in the outer layer. Since phytic acid can block the absorption of these important nutrients, too much in our diet can lead to mineral deficiencies and poor bone density. My version of muesli is dairy-free, using coconut milk instead of the traditional cow’s milk and yogurt. I also leave out the nuts, opting to add more seeds instead. It’s also important to note that though oats are gluten free by nature, they’re often cross contaminated with gluten, and therefore it’s important to look for gluten-free oats if you have an allergy or sensitivity. The best part about muesli is you can customize it to your taste and dietary needs. Try adding shredded apple or mashed banana, slivered almonds and spices like cinnamon and nutmeg. I encourage you to take my base and go wild with experimentation! 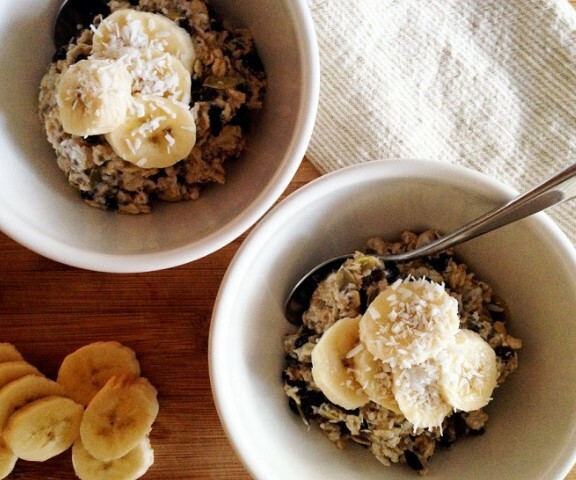 Oats: Oats are a great source of soluble fibre that help eliminate cholesterol and any extra toxins in the body. They’re a high source of manganese contributing to bone health and the high fibre content ensures your blood sugar doesn’t spike. Coconut milk: I choose this non-dairy alternative because it adds a naturally sweet and rich flavour, plus it contains all the naturally amazing benefits of coconut. Coconut contains lauric acid which is a natural antibacterial and antiviral and can play a role in supporting our immune system. Coconut milk can get a bad rap for its high saturated-fat content, but it’s important to understand that this plant-based fat consists of medium-chain fatty acids that are burned easily by the body and won’t raise cholesterol levels. This ultimately helps you maintain your weight instead of making you gain more. Chia seeds: Another source of soluble fibre, these little seeds are loaded with nutrients. Chia is a high source of omega-3s (even more than flaxseeds) the essential fatty acid that’s been shown to improve digestion, hair and skin health, mood, heart health, brain function and cholesterol levels. They’re full of protein and calcium too, making me wonder why we don’t throw these seeds on everything. Hemp hearts: Hemp hearts are a complete vegetarian protein and full of B vitamins (important for energy and mood). They’re also anti-inflammatory, blood sugar regulating and keep you full for longer periods of time. Currants: I use currant to add a bit of natural sweetness, but they actually also add a surprising amount a protein (six grams per cup). Full of the protective antioxidant vitamin C, currants can play a role in the health or our skin, hair and hearts. Pumpkin seeds: Ever since I found out the amazing nutrient profile of pumpkin seeds, I’m never without a jar. Pumpkin seeds are a great source of vegetarian protein, omega-3s and zinc, which has a large impact on our immune function (just in time for cold season) and well as in the prevention of osteoporosis. 3. In the morning top with fresh fruit, nuts, seeds or any other superfood you have on hand. My favourite is raw cacao, more coconut flakes and sliced banana.